Manufacturer of a wide range of products which include pvc garden hose pipe and suction hose pipe. 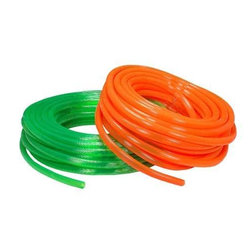 Our organization is engaged in offering a wide range of PVC Garden Hose Pipe for use in gardens or lawns for watering plants. We also offer a large number of attachments like sprayers and sprinklers with these hoses. Our garden hoses are highly resistant to adverse weather conditions and boast of long serviceability. Usually used to concentrate water at one point or over large area, these garden hoses are used in attachment with a hose spigot at one end. We are offering these high quality products at highly affordable prices to our clients. CHAMPION Flex PVC suction pipes are a challenge to the best of productsin the industry. It has a rigid PVC spiral reinforcement between soft wallswhich makes it an ideal replacement to rubber pipes. It is light in weightand extremely flexible. It can be put to task even at the most demandingcurves & bends with absolutely no loss of flexibility. Smooth inside andoutside, it has excellent resistance to pressure, external impacts, most ofthe chemicals, gases, light acids and saline water.